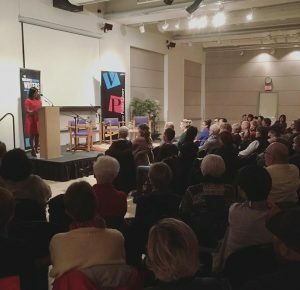 The Vancouver Writers Fest has kicked off an exciting week of events spanning from October 15 to 21. The annual festival offers over 70 literary events peppered across various Granville Island venues—namely Performance Works, Revue Stage, Studio 1398, Waterfront Theatre, and Granville Island Stage—throughout the week. The Fest gives attendees the chance to explore different literary genres. Events are broken up into categories with focus on specific genres and themes. The Writers Fest also lets festival-goers discover and support over 100 local and international writers. Attendees can be involved in conversations that emphasize the importance of not only just taking part in reading and writing but celebrating them as acts of art and education. Events begin each morning, starting as early as 10 am, and typically run for an hour and a half. There’s an average of 10 events taking place each day, so there’s a lot to choose from when deciding what you’d like to attend. The ticket prices for all weekday events range from $20 to $26 for regular admission. For fans of suspenseful thrillers, there’s Can’t Look Away with mystery writers Michael Robotham, Liz Nugent, and Iain Reid on October 16 at 8:30 pm. On October 18 at 8 pm, there’s Politics & Prose with Chelene Knight, Waubgeshig Rice, and Javier Zamora. For comic book enthusiasts, you’ll want to see The Superhero In You with E. Paul Zehr on October 19 at 10 am. For fans of humour, there’s Told with Humour on October 19 at 8:30 pm with Randy Boyagoda, Rawi Hage, and Maureen Medved. There’s also the Poetry Bash on October 19 at 8 pm, featuring Shane Koyczan, Billy-Ray Belcourt, Julie Bruck, Sabrina Mahfouz, Javier Zamora, and Katherena Vermette. On October 20 the Fest is offering a “Free Saturday”, giving attendees on a tight budget the chance to go to events for free or by donation—donations go towards supporting the festival and keeping it accessible and affordable—which is a great initiative to bring these types of events to everyone, regardless of their situation. Tickets for the Saturday events can be reserved online, with a small number to be held at the door of each event. The lineup for Saturday is seriously impressive, with events like YA Rising, a look at young adult literature with Rachel Hartman, Uzma Jalaluddin, and Kim Purcell at 2 pm; a discussion about intertwining history and fiction with Scars of History featuring Esi Edugyan, Alix Hawley, and Rawi Hage at 8 pm; and a showcasing of The Best Canadian Poetry at 2 pm with Dionne Brand, Canisia Lubrin, Shazia Hafiz Ramji, and Christopher Tubbs. The week of events and activities promises to be eventful, inspiring, and most of all, entertaining. There’s something for everyone, and anyone who does get the chance to attend will hopefully leave Granville Island having learned something new or found something to think about—feeling the powerful impact of the Vancouver Writers Fest nonetheless.